In the following blog post, we will focus on the structure of the Amazon Demand Side Platform and how advertisers can leverage DSP to retarget customers and drive new demand. What is Amazon Demand Side Platform (DSP)? Who Can Use Amazon DSP? The Amazon Demand-Side Platform (available within Amazon Advertising Services) enables advertisers to programmatically buy display & video ad placements. It also allows advertisers to reach, educate, and re-engage customers on and off Amazon. There are two sides to Amazon Advertising including the Advertising Console and Amazon DSP — one is geared towards PPC (pay for clicks), and one is geared towards Display (pay for impressions). Amazon DSP is available to brands who sell products on Amazon (vendors and third-party sellers). Programmatically buy display & video ads at scale. Expand their customer reach beyond Advertising Console capabilities. Cannot sell their product through Amazon but want to leverage Amazon Audiences. What is Enterprise Self Service (ESS)? You can choose to let Amazon manage these ads (Amazon Managed Service) or manage them through ESS (Enterprise Self Service). ESS is Amazon’s Enterprise Self Service portal in which agencies can access Amazon’s Display/Remarketing (Amazon DSP), rather than going through Amazon’s Internal Managed Services team. Pro-Tip: Keep in mind brands must go through an agency to gain access to ESS. Amazon DSP is a programmatic display advertising platform—meaning it uses technology to more efficiently buy and manage your display and video advertising mix. What are Dynamic Ecommerce Ads? Ecommerce Ads boost product visibility through advertising and reach millions of Amazon shoppers with ads linking to product detail pages. They also help brands drive sales with interest-based or product targeted advertising. Dynamic Ecommerce Ads take consumer targeting a step further by showing your potential or returning customer an ad creative based on their past purchasing behavior. In-market Audiences are leveraged to reach customers who are likely to take action or make a purchase based on a recent search, browse, or purchase behavior in the past 30 days. Lifestyle audiences reflect broad interest groups. Advertisers can reach lifestyle audiences to plant their brand in the minds of shoppers who have regularly shopped for related products in the past year. 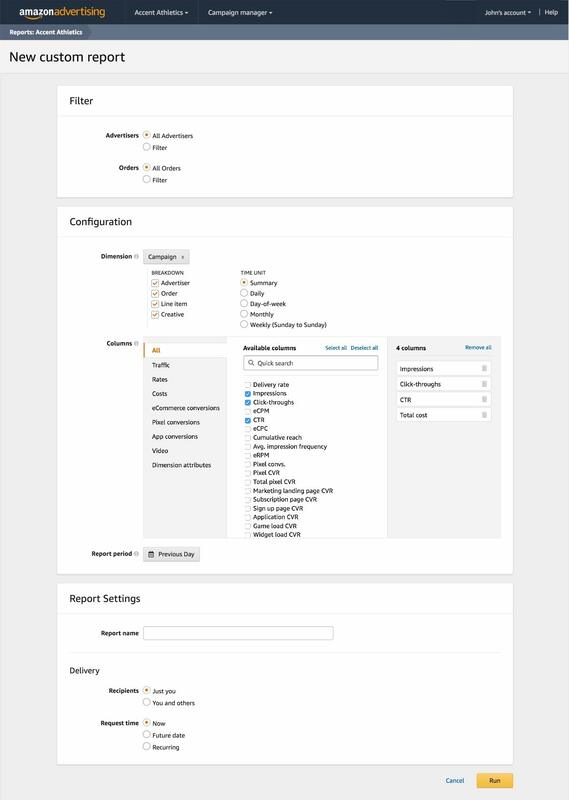 In March 2019, Amazon introduced 4 new updates to the Amazon DSP user interface including navigation, bulk editing, custom reporting, and creative moderation. Navigation – One of the biggest changes Amazon made was the “overall look and feel of the Amazon DSP”. According to the announcement, navigating within the Amazon DSP is now more intuitive and efficient than ever before. In the new layout, buttons, toggles, and campaign status information are much more prominent. Custom reporting – This feature allows advertisers to create a report based on your unique requirements and save it within the Amazon DSP report center. You can now select the exact columns you would like to include. Once you run a custom report, it will appear in the report center and will be emailed to the recipients you specify. Creative moderation – Lastly, Amazon is working on a number of improvements that will reduce the turnaround time for creative approval. For example, they significantly reduced the average time it takes for advertisers to be notified if your creative needs to be revised. As you can see in the client data below, in Q4 2018 we saw a significant jump in ROAS for many of our Amazon DSP retargeting campaigns on Black Friday.